Anida Yoeu Ali (b.1974, Battambang) is an artist whose works span performance, installation, public encounters, and political agitation. She is a first generation Muslim Khmer woman born in Cambodia and raised in Chicago. After residing for over three decades outside of Cambodia, Ali returned to work in Phnom Penh as part of her 2011 U.S. Fulbright Fellowship. Utilizing an interdisciplinary approach to artmaking, her installation and performance works investigate the artistic, spiritual and political collisions of a hybrid transnational identity. She is the 2015 Winner of the Sovereign Asian Art Prize, Asia’s most prestigious and longest running contemporary art award. Her artistic work has been the recipient of grants from the Rockefeller Foundation, Ford Foundation, the National Endowment of the Arts and the Illinois Arts Council. Ali earned her B.F.A. from University of Illinois (Urbana-Champaign) and an M.F.A. from School of the Art Institute Chicago. Ali is the co-founder of Studio Revolt, an independent artist run media lab whose works agitate the White House, won awards at film festivals, and redefines what it means to create sans-studio and trans-nomadically. Studio Revolt’s public performances and resulting images of Gallery X and Public Square were part of Our City Festival 2011 and 2012 (Phnom Penh). Ali’s The Buddhist Bug, a multidisciplinary work that investigates displacement and identity through humor, absurdity and performance, has been exhibited in Phnom Penh galleries, Singapore International Photography Festival, Malaysia Heritage Centre Singapore, Southeast Asia ArtsFest London, and featured at the 5th Fukuoka Asian Art Triennale where Ali participated as an artist in residence. Ali’s work has been in group exhibitions at the Asia Pacific Triennale at the Queensland Art Gallery (Brisbane, Australia), Palais de Tokyo (Paris, France), Musée d’art Contemporain (Lyon, France) in 2015. Ali’s artworks are included in private collections and the public collection of the Mainland Art Fund, Australia. Ali currently serves as an artist-in-residence at the University of Washington Bothell where she teaches performance, global studies and social justice courses. 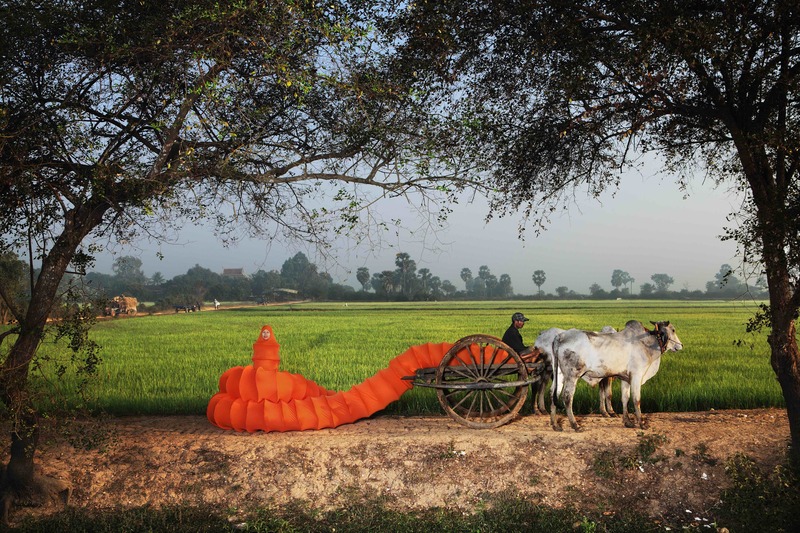 Ali’s The Buddhist Bug, a multidisciplinary work that investigates displacement and identity through humor, absurdity and performance, has been exhibited in Phnom Penh galleries, Singapore International Photography Festival, Malaysia Heritage Centre Singapore, Southeast Asia ArtsFest London, and featured at the 5th Fukuoka Asian Art Triennale where Ali participated as an artist in residence. Ali’s work has been in group exhibitions at the Asia Pacific Triennale at the Queensland Art Gallery (Brisbane, Australia), Palais de Tokyo (Paris, France), Musée d’art Contemporain (Lyon, France) in 2015. Ali’s artworks are included in private collections and the public collection of the Mainland Art Fund, Australia. Ali currently serves as an artist-in-residence at the University of Washington Bothell where she teaches performance, global studies and social justice courses. Annie: Could you please tell me a little bit about your training as an artist, and your performance work, and when you shifted from spoken word poetry to something that was focused on visual? Anida: My performance background originated in poetry and rooted in text, and usually it is written original text, usually autobiographic text that is chronicling my family’s history and my personal struggle being raised in America and being someone who is considered bicultural. That started in 1998, with the formation of my spoken word group, “I was born with two tongues”. I was at the time the only Cambodian American in the poetry scene, the people of colour poetry scene, performance scene, the Asian American artist scene, so it was very lonely to identify as a Cambodian, and therefore a lot of my early formation was based on a pan-Asian American identity and looking at shared struggles and shared history as a political identity. That really informed a lot of my early works and trajectory. And it wasn’t until 2005 that I had received an opportunity to come as part of the Mekong Project Artist Residency that was facilitated and hosted by Dance Theatre Workshop in NYC, and because I participated in the first version of the Mekong project in Chiang Mai, Thailand, they invited me again when it was hosted again in Phnom Penh, Cambodia. This was sort of a very big moment for me, because I had never come to Cambodia, ever, at that point, and it had been 30 years already. I left when I was 5, not by my choice, in 1979, when the borders were reopened, and the Khmer Rouge was ousted from power, my family left for the US and I was raised in Chicago. So at that time, it was just a really big deal for me to go back as an invited artist, someone with Cambodian ancestry, and as an artist, and to return alone, not with my parents, not with any family members, and with absolutely no obligation to do anything with family. And to completely be immersed amongst artists. It was very eye-opening for me. What I had carried with me back to Cambodia were my poems. Through the residency project, I had the chance to perform my poetry to the Cambodian audience and an international audience. It was hosted at Sovannaphum, the shadow puppetry arts place, and it was also performed at Reyum Institute and Amrita. That’s when I met a lot of the key arts administrators, and also artists – many people who have at that juncture, or so early on in their artist careers, who have since flourished and come a long way. And one of my early performance art pieces was the time my work started to shift towards the visual, and I remember by the end of that residency period, I was able to move beyond my poetry and create an installation as well as a performance art piece at the site of Tuol Sleng. That was a very powerful moment, intersection, year and has stayed with me forever, and has made me realise that it was possible to be in this in-between place, to honour your in-betweenness as an empowering place to create. That performance work was called “Visiting Loss” – a very strongly diasporic themed piece, based around a piece of poetry I had written that talks about my loss and inability to rectify what’s been lost, in terms of my identity and being in a place like Cambodian not knowing my place exactly, even though I’m told that that’s where I belong. I delivered this poem in English and I was dressed in an interesting costume that I created, that was a dress that was meant to be shredded and ripped. The poem has lines about absences. I had written on these strips of fabric, lines of absences that were velcroed to my dress, and then essentially ripped from my dress and thrown onto the ground. My dress had really really long arms that were created in such a way that became also the restrictive binding thing, sort of like a straitjacket. I delivered the poem while I was in this dress that was restricting, and it was a multi-media piece, and I just remember being told by many audience members – because they had to have my poem be translated into Khmer – and of course it was a transliteration, so of course, it wasn’t a very good translation, we didn’t have time to do a very good translation, but they just needed something in the programme. It was a time where English was not spoken as widely as it is now, and so I got a lot of responses from Khmer audience members that while they could really feel the passion of my words and they loved the way I performed it, so emotional, but they had no idea what I was talking about. What happened was that that was such an arrow through my heart kind of moment, because they couldn’t understand the meaning and I wanted to badly for people to understand and feel what I was feeling. But the English that I had perfected in America, which is, you know, very important for people to speak perfect English and to lose their accent, all the stuff that you’re kind of assimilated into believing, it just, language had failed me in Cambodia, which of course makes sense, but the very tool I thought I had perfected, had failed me so terribly and in its loss of translation, that, in that moment, I know that my work needed to shift because I wanted my own people to understand my work. And I wanted more audiences that didn’t have access to English to understand and feel and experience what is my work of art. Annie: How has your performance work developed since? What is it about performance that is so important to you – especially in terms of feminist politics? Anida: Since 2003, that was really the serious moment of my work departing from text, and when I started to study movement and Butoh particularly, and also experimented more with textile and movement installation, where I would create, in theatrical pieces, I was focused more on the scene-setting, scenery, and that essentially became an installation space. It would take me 7 more years on top of that. So from 2003-2010, until I started to conceptualise the Buddhist Bug (2010) and even in between 2003-2010 I would go back to Cambodia several times, but I was never able to create work during that time. I was only returning to Cambodia, mostly to take notes, sketch, observe, experience, feel, just take everything in, and then things would click for me upon returning to live there to do my Fulbright work in 2011. Well, ‘feminist’ – absolutely, my personas are all feminist heroes. They’re all the heroine figures, the personified woman, the Bug isn’t necessarily a woman, the Bug I always say is gender-fluid, holding all genders. But obviously the Bug is rooted in my biography, of course, people can attribute feminine qualities to her. But everything that I do is rooted in acknowledging the woman and the woman’s role, and the woman as key to creating a story for people to enter into. And because text is a part of my background, it was very natural for me to extend my use of language and words and transform that into fabric. So a lot of my installation, textile installation, soft sculptures- a lot of that takes up a lot of fabric, metres and metres of textile, but they’re actually like my skin. It’s like my stories extending into space, into rural settings or into urban landscapes, whatever it is. That’s why the red Naga dress is so long, that’s why the black and white vertical dress takes up so much space, again it’s very long. The Buddhist bug also, the length in many ways, these are all bridges, these are all showing one point to another, and that sort of distance, that length for me, for what’s become this way of existing for me, which is between two points – Cambodia and USA, over here and over there, between the person that I am and the person I want to be, like my heroine. I guess there are many ways to interpret it, and the use of textiles and long costumes are just extensions, since I don’t use words anymore, what I have left is my body and that which covers it, and that is naturally for me, textile. Performance to me – the more I went into work that was non-verbal, the more it became an internalised experience for myself, and the more I realized, an acute awareness of myself in that moment of performing, that it also opened it up for people to interpret and engage. It was as if words shielded me too much. Like the words became a kind of shield, a defence, a barrier from allowing people to come closer to me. But nonverbal performance in many ways breaks down that wall and allows for a more visceral experience because there is nothing, no words between your body and the audience. That shift into more non-verbal expression, into durational work, into visually-engaged work – I think the power of that is I was able to use these other tools to engage the senses, to create experiences that were more open-ended for people to enter. Annie: You talked about the everyday life. Can you describe what kind of audience really is important to you, and how did they react to your work? Anida: I get a lot of reactions of curiosity. That’s kind of the biggest one, inquisitiveness, perplexedness. But also as people see the work, it gives them permission to imagine what the answer could be. Because oftentimes when they ask myself or my team what’s going on, they make up the artists for themselves, because oftentimes we throw it back at them, and say, well, what do you think is going on here? What do you think this could mean? And so those conversations are happening in those moments of interaction and engagement, and I think I go into many of these spaces and I talk to people and I ask for permission and I show them photos and show them sketches and I talk it out, I make sure I have a translator if my Khmer is too difficult to understand or if my concepts are too big for my language abilities. There’s a lot of research that goes into me selecting certain spaces and neighbourhoods before that even happens. It’s never improvised in a way that feels too disruptive. I think that all those moments, for me, even when there’s the residual of it in the gallery spaces, so let’s say, things when there are hundreds of people contributed to the making of that, including the various Khmer people in the scenes – for that piece to go into a gallery space, I feel like the residue of making a statement to the gallerists to say that, when you think of contemporary Cambodian art, I hope you’re thinking of what Cambodia looks like right now with all these people who are making it. It’s not just Anida, the artist, making this work, it’s Anida and the hundreds of people in Cambodia that helped her make this work. And gallery viewers of a particular audience can’t turn away from that. That’s why when they look at ‘Into the night’, they’re looking at hundreds of bar girls and regular people going to an amusement park, they’re looking at vendors, they’re looking at the everyday people of Cambodia that have helped to create my work. Annie: From your experience of being in Cambodia, what do you think of the last five years of development of performance in Cambodia? Anida: Prior to my departure, young people were still very much interested in performance art and performing. The problem I feel in the Cambodian arts community that they always feel like they need permission, or facilitators around to get it going. It feels like if there’s not other people around to help give them permission to do something, it doesn’t happen or there’s a lot of self-censorship that happens. I know during my time there I saw that a lot, which is Cambodian artists feeling like they can’t do something because someone’s going to say no, or it’s too much trouble to get the permission, or to talk to this and this person, it’s almost like they’ve already played it out in their minds and they think it’s too hard to do, to complicate it, and they just don’t do it. It’s like they never try to push the line – we all know that in order to find the line between what is permissible and not, or between anything, you’ve got to push against it so that the line can be better defined. If you don’t push against it, you’ll never know what the line is. And so many times artists in Cambodia feel like we talk about the line, it’s been passed down by family, by elders, by mentors, by other Akamai artists that you don’t do this, you don’t do that, you can’t talk about this, but it’s like a mythology, because no one’s actually tried to push up against it enough. So that’s why I say the self-censorship happens, and also the fear, but also because the community is so young in its engagement, there’s no real art history being taught that there’s not that contextualising, so oftentimes they feel that they need that mentor or figure to help facilitate that process. That that’s the true thing that isn’t happening as much, but I feel like SASA Arts is doing that a bit, and I feel that in Battambang because of the school that’s happening. But it doesn’t feel as it could be as strong. I do feel like there’s a wall. It’s a difficult position to be in for many of us who had facilitated some things, because it’s a lot of work, and I was happy to do it at the time and bring the energy there, but it also comes down to how dedicated people are to their practice, it’s also becomes almost a weaning out process. But it’s also a statement on how very unsustainable the practice of art is, especially in countries like Cambodia where it is life or death survival as an artist. Without the right structures and advantages in place, then artists can’t do it, and artists get tired, and won’t, can’t go on. Don’t have the tools to keep doing it and maintain it. The artist Phe Sophon was making the coffee shop tuktuks, and that’s how he makes his livelihood now. He was huge part of Reyum Institute, and I remember seeing his early works using found material to create installations and stuff, and now it’s about a livelihood and providing for his family, so he constructs these coffee shop tuktuks. Annie: I think this issue of sustainability is aligned with this other sense of fragility of art history, and hence how important do you think is documentation and an archive for art history and for an artist’s practice? I ask this being mindful that with JavaArts having had a fire, there was an irrevocable loss of records and artwork. And when I interviewed the artists in Battambang, a lot of performance documentation is recorded on social media, mixed up with personal collections, with a very contradictory communal memory of when things happened. Anida: All of it is important; the problem is who gets to see it, who gets to engage in it. Having a living archive of some kind is more important, something where people are constantly, that people have the knowledge and have access to the knowledge, and transfer the knowledge to others. I think that’s the biggest problem. Obviously one of the most significant books now in Cambodia is Ingrid Muan’s Cultures of Independence: An Introduction to Cambodian Arts and Culture in the 1950s and 1960s. That is a remarkable book but there needs to be more of those to chronicle what’s going on, but then there needs to be a teaching of that material, so that it gets passed down, that it actually gets used. Because if the archive is only going to exist as documents that only Western-educated people who are studying in the region have access to, then I don’t think that’s valid. I think that the history needs to live with the people that are there. It needs to be part of the fair curriculum, it needs to be the few people who are doing art history need to be passing the information along. And on top of that, artists themselves need to embrace some of that documentation and not be judgmental about it, not immediately say, this person is not part of that, or so on. It gets territorial and that’s where it also becomes problematic. But I’m interested in trying to answer the question of how can the documentation and the history be engaged on a consistent basis. Annie: Do you think some kind of infrastructure such as an institute or more platforms are helpful to try to instigate more activity in this performance scene here? Do you not think more platforms could be helpful at all? Anida: No, I do not believe in any more institutions popping up. I believe you need to work with what’s already in existence and make it stronger. I don’t believe in any more forces coming in and trying to tell people what to do, or trying to create a third entity or something. It’s been so many years and John and Sophiline Shapiro of Khmer Arts have been privy to many of these discussions trying to form this and that, they’ve been involved in so many conversations over a decade, and it just doesn’t manifest, it doesn’t work. It’s about incubating, strengthening what’s already on the ground. I also just hate the work platform too. That’s what it is, it feels very political, the word itself is very NGO-ish. I’d rather say, it’s true that in order for new things to be birthed, other things need to die. That’s just the karmic cycle of life, I do believe that things spring from other things ending. I do believe that there needs to be other opportunities and it always comes down to that, I think, within the Cambodian contemporary arts scene, I think it comes down to the opportunities that can allow for people to have essentially what are goals. Many artists within the contemporary art scene are very goal-driven and therefore need something to produce work first. Because of the lack of art history and the lack of contemporary art classes and courses, and education on that, the praxis – people’s artistic praxis – isn’t quite in place. That’s why you’re also seeing those answers of people doing things in relationship to opportunities and chances that come up. And so I do believe that people’s impulses are not going to just spring up because I think they do need some direction to explore their ideas, in a way that feels like they’re being paid attention to, and they’re getting something out of that, whether it’s monetary, or feedback, or just the ability to create something to show. It’s a very practical thing. So I’m all for other festivals and other things coming into being, because that just seems like the only way for this small community to keep going. I think there needs to be a lot more education and outreach of Khmer artists to their local audiences, and by that, I mean local Khmer artists need to have a practice in which they have studios, they have a place they work out of that they can invite people to have regular discussions. There needs to be a centre that has that. Not just create in your studio, or create and show it in a limited space, but do the work of trying to get new audiences. People here in America always talk about cultivating new audiences, and cultivating the audiences they already have, and it’s work, it’s a lot of work to maintain it, because it means you have to maintain a level of education. I’ve always thought that there’s so much money in Phnom Penh that I’ve never understood why artists couldn’t get to that money. Why we couldn’t talk to those rich people, or the kids of the rich people, because what always happens with new money is that the first generation of people with new money is always going to hold on to their old traditional values. The new generation of new money would have had education, and are more travelled, experienced, that there’s an opportunity there to talk and engage with those people so that there is an interest, or they can create a foundation that helps funnel money into the arts or something. I’ve always felt that there’s opportunities there but it takes a lot of leadership, it takes charisma, and it takes a lot of work to cultivate that into something that could become like patrons of the art scene. And that’s how you’re going to get the local audiences interested and valuing the work. You just have to go to them, you have to make presentations, you have to show what they’re missing out on, you almost have to take it like a marketing thing where you show them, here’s the value of what this person is selling on the market and here’s what they’ve been able to do with just having that recognition. It’s just laying down the basics of why you invest in your own people, and particularly your artists, why you invest in your artists. The Red Chador, Paris, 2014, Anida Yoeu Ali. Annie: What are you working on now that you’ve left Cambodia? Are you making another performance work? Anida: I hate to use the words I’ve left Khmer – I’ve never ever plan on leaving my Cambodia. It’s with me, Cambodia is with me, I’m with Cambodia, we’re just having some issues in being in the same space now. But it’s a long-distance love relationship. Right now I’m fully engaged in my next series, which is the Red Chador. She was created in Cambodia, and the first iteration of that was in Paris at the Palais de Tokyo, and then she travelled back with us to the US, when I exhibited her in Hartford, Connecticut, and walked the campus of Trinity College where I am the visiting assistant professor. Now she’s about to go to Washington DC, the capital of America, to a memorial weekend, which is a very important holiday where there is a volume of patriotism and nationalism and all things war-related comes out into the open, in terms of Americans supposedly honouring all of that. She’s going there but it hasn’t been without controversy of course – I have been severely censored in the process and almost was not allowed to participate amongst the 40 artists that are part of the festival. 2 of us got red-flagged by the Smithsonian Institution, so the last couple weeks have been about negotiating, adapting and now the piece has come to a point where she’s allowed to be there but she can’t do anything more than be silent. And if she goes rogue, I will get the curator and the director fired. It’s a really interesting heavy burden, but it’s the price of performing at an institution where there’s such a lack of representation of people of colour, but also there’s such a heightened fear of Muslims, and the Islamophobia is so high that for me it just trumps it all. But the Red Chador needs to be in Washington DC, and she needs to hold space in the Smithsonian by all means necessary, even if it means I have to shut up just to be there and stand amongst 99 US flags. With thanks to Reaksmey Yean. This interview is part of a series that began with my curatorial research residency in Cambodia in 2016, which was kindly supported by Java Arts, the Artists International Development Fund and National Arts Council Singapore. The interviews and materials will be accessible at the Live Art Development Agency as part of the Southeast Asian Performance Collection launched by Something Human in November 2017.